Since the PlayStation originally launched in 1994, Sony has revealed that the company has sold over 525 million PlayStation systems across the world. 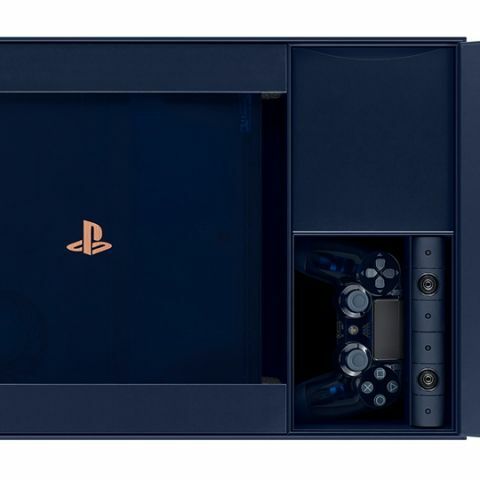 In order to commemorate this momentous occasion, Sony has announced a “500 Million Limited Edition PS4 Pro.” This new console has an all-new colour treatment and while the design remains the same, there are some new materials being used to give it a very unique look. The limited edition console comes in a shade of blue, but what makes it really special is the translucent casing. The console also gets a copper trim and numbering. In the box, you also get matching Dual Shock controller, a PlayStation camera a stand to place the PS4 Pro vertically and a mono headset. Additionally, the PS4 Pro console itself comes wrapped a nice blue velvet bag. This will be the first console from Sony to come with a 2TB hard drive built-in. Sony will only produce 50,000 units for sale around the world. In case you’re not able to get your hands on one of these very special consoles, Sony will also sell the controller separately for $65 and a wireless headset for $100. There are a few extra special units in the lot of 50,000 which are etched with numbers that correspond to special dates and milestones in the PlayStation’s history such as 09995 which was when the PlayStation launched in the US and 01013, representing October 13, 2016, US release date of the PS VR. The 500 Million Limited Edition PS4 Pro edition will go on sale around the world on August 24, 2018, for a retail price of $500. The regular Sony PS4 Pro currently retails for $399 in the US, so there is definitely a premium price tag attached to it. With just 50,000 units being made available worldwide, there is definitely going to be rush to grab one of these special units of the PS4 Pro. There is currently no word on whether we can expect these special edition units to also hit Indian shelves. When price of ps4 will decrease? Which one is better playstation vita or playstation tv?